Most Koreans gain a black belt in the their teenage years, while those that did not have to take it at least 1st Dan during their 3 years military service. 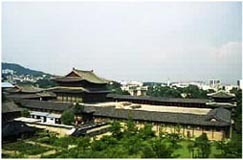 This makes Korea the home to the most Taekwondo practitioners in the world, making Seoul the beating heart of Taekwondo. For Taekwondo students a trip to Korea is a pilgrimage to the source and flowing river of Taekwondo. The competetion season in Seoul is unrivaled. Its sports universities produce the highest level of Taekwondo students in the world, as a result the Korean team is the best on Earth. Taekwondo is practieced and understood here in a way that many can not rival. For Instructors who wish to compete on the international level a trip to Korea to learn the latest training techniques is a pre-requisit. For those who are serious about Taekwondo a trip to Korea is not a question of if, it is a when. 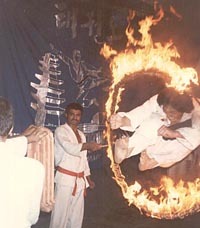 In Korea Taekwondo can be seen in its original setting, as a functioning part of Korean society. The parralels between Korean culture and the philosophy of Taekwondo give a much deeper understanding of what Taekwondo really is. Taekwondo is a very traditional activity in Korea as well as being its modern national sport. 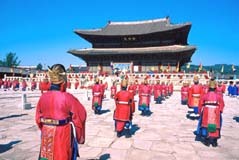 In Korea is is possible to see first hand these traditions alive today. To Koreans Taekwondo is a life times commitment. In many western countries Taekwondo is just seen as an other martial art, but here in Korea the points that make Taekwondo so unique stand out and our appreciated by all. For foreign people it is very difficult to find or learn from people who have dedicated their whole life to living the Taekwondo way. In Korea the Taekowndo man takes on a different meaning to else where in the world, to understand this it needs be seen in the original enviroment. Here in Korea it is possible to see the mountains and valleys that created the deepest parts of the Taekwondo philosophy, influenced the way the Poomse were developed and are the foundation of the history of Taekwondo and the Taekwondo way. In the academy there is accommodation in individual and shared rooms.There is space to relax after training with a large television and Internet access. Washing up is done by the students. training is compulsory in SANGROK, however it is hoped that as Taekwondo students all students live up to morals of Taekwondo. Dinner is after training and is a good time to learn about each other and to talk with Master Chang about martial arts, about Korea and anything else. This is also a good time for each students to discuss any points they may want to raise about their own training. At the weekends the many students like to go out and experience the joys of Seoul life, it is recommended to follow the Koreans advice of where to go, as like all fast moving cities, it changes all the time. 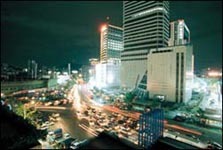 There is excellent shopping in Seoul and much to be seen and done. Information about how to get to some of the main tourist and Taekwondo sights has been saved on to the computer in SANGROK in English for students by others who have been. Training is held every week day in the evenings. This is the main training session of the day. These training sessions are high energy training, focusing on intensive foot-work, kicks and sparring. In the early afternoon there is an infromal training session with master Chang, students work on their own individual problems or work on things that they found difficult the evening before. M aster Chang's unique style is evident in the more traditional aspects of his Taekwondo too. In performing the Poomsae, the SANGROK style emphesises the very same principals which rule its modern sides: executing power with minimum effort, the flowning of movements, and above all, the grace and beauty of the Taekwondo movements. Working on the Poomsae is individual and each student practices his own level's Poomsae. Students who stay for longer periods of time very often choose to completely adopt to the SANGROK style and in that vain go back to basics and build their ability from there. After the evening sessions the students usually play indoor soccer with Master Chang, thus improving their stamina and power even more, just before collapsing, exohausted, into their dinner chiars. sent as an email attachment. It is very easy to get to from the airport. The air port bus stops just a few meters from the academy. The bus driver will tell you when to get off if you show him the note.